It's Wordless Wednesday again. Where has the year gone? That is one o cool mural. Is this mural in San Francisco? wow, such a cheerful mural. it brightens your mood even on dreary cloudy days. Very impressive mural. And I was just asking myself the same question the other day, just where has the year went. It seems to have went past too quick! Nice mural. A lot happening there. Nice mural, and you got a great angle in photographing it (very straight and clear). Lina: Thanks and I agree, I hope everyone has more photo adventures to share. Louis: Yes, it is in SF's Mission District by 24th Street. So many photo ops in the city! Life Ramblings: You are correct. I was debating what to post as the last Wordless Wednesday photo so in honor of the new year, the mural reminds me of a celebration. Too bad the people who live in the building can't see the mural other than standing outside. Rainfield61: Yes, let's celebrate. The people in the mural have already started. William: I bet the artist(s) took awhile to complete the mural and they too wondered where the time went. Yogi: Hope it's a sign for more exciting adventures for everyone in the new year. Stefani: Thanks for visiting! 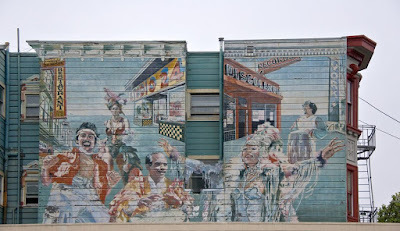 There are lots of murals in San Francisco and probably in most big city. Very cool work of art! Happy New Year! Wish you and your family a very happy and prosperous new year ahead, 2011.